IMS (Insulated Metal Substrate) is a solution for the increased requirements concerning heat transmission of circuit boards. Fields for this technology are, among others, high current applications, Power-LEDs, transistor cooling systems, SMD and power circuit boards. The high thermal conductivity allows for a quick and effective transmission of occurring heat. For some time now, the automobile industry utilizes IMS circuit boards in increasing amounts. Even with simple designs heat can be efficiently „managed“. The aluminum substrates are available in thicknesses 1.00 – 1.50 – 2.00 and 3.00 mm. 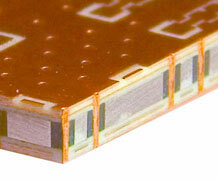 The copper thickness depends on further requirements and is available from 18 µm to 105 µm. The isolation between copper and metal core is 50 - 150µm. This results in a thermal conductivity of 1,3 - 3,0 W/mK (typical: 1,7 - 2,2 W/mK). The most cost effective version is made up of a single-sided circuit which exhibits the above mentioned thermal conductivity. Furthermore, there are several possibilities of combination: For example multilayer circuits with metal core, or substrate applied subsequently from outside in connection with heatsink filled vias in arbitrary amounts of layers. It’s a drawback though that the thermal conductivity sinks decidedly in comparison to the above mentioned values. On the one hand, this results from a combination with FR4 material (thermal conductivity only approx. 0.3 W/mK), and on the other hand it is much harder to transmit heat from an metal core placed inside. The alternative with the metal core applied from outside offers the advantage that the „ready“ circuit is pressed into the aluminum using special thermally conductive prepregs. This allows for a much larger scope of design for the layouter. Vias filled with heatsink compound represent a thermally viable heat transmission to the metal core. With this technology, heat can be transferred in the most effective manner when a complex circuitry is unavoidable. For optimal planning of your design, we recommend you contact our technology team (Tel. 030 / 351 788 – 155) as early as possible. We are glad to offer our advice for your development.